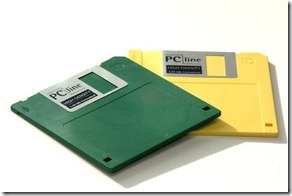 As the title says, Sony have finally ended production of the ever wonderful 3.5 inch Floppy disk. I well remember the days of only being able to carry ~1.5MB of data around with me. Just look how far technology has come, I can carry 4GB in my pocket on a card many times smaller than the floppy disk. And for something that was developed in the 1970s to still have the popularity it does today is great. A floppy disk is a data storage medium that is composed of a disk of thin, flexible ("floppy") magnetic storage medium encased in a square or rectangular plastic shell.